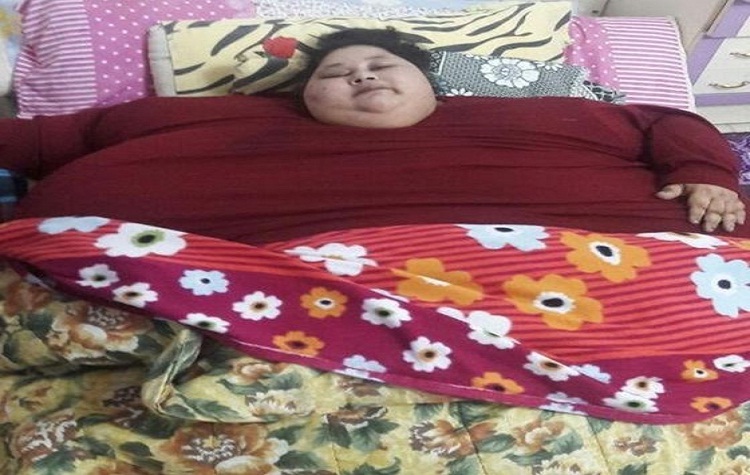 World heaviest woman Eman Abdulati has confessed being in love with Bollywood Superstar salman Khan and expressed her desire to meet the star. Eman Abdulati who weighs 500 Kg lives in Alexandria, Egypt was brought to Mumbai’s Saifee Hospital for Bariatric surgery. She was brought to the hospital in a flight from Alexandria to Mumbai on her bed. She was carried inside the hospital with the help of a crane. Eman told that she is a big fan of Bollywood and loves watching movies of Shahrukh, Aamir and Salman but she has specific interest in Salman Khan. Eman has installed a television inside her room in which only Hindi songs will play and not Arabic. As per the Doctor, Eman is suffering from Elephantiasis and was born with an abnormal weight of 5 Kgs. Her weight was increasing on abnormal rates. At the age of 11, She suffered from a brain stroke, which made her partially paralysed. Eman has not left her house since last twenty five years. Her weight reduction treatment was going in Alexandria but the Doctors were unable to find any permanent solution for her. So, they referred Eman to Mumbai’s Saifee Hospital. Initially Eman had to face a lot of difficulties for arriving in Mumbai. Eman’s Practitioner requested Foreign Minister Sushma Swaraj to grant her the visa. Now, Eman is in Mumbai and her treat has begun with Doctors undertaking her in observations for three months.